UPDATE 16/07/08 – Added Optis SPEOS to list of validated (not “certified”) software products and Test Case 5.11 analysis. As one of the 24 members of CIE Technical 3-33 that wrote the report (mostly as a technical editor and reviewer), and also as a member of the IES Computer Committee that spent a decade attempting to write a similar document, I can attest that it was a monumental task. It is therefore understandable that there were at least a few errors in the final report. The first and most important of these errors became apparent a year later when one of the first validations of a commercial lighting design and analysis program was conducted (Dau 2007). Further errors became evident during the preparation of a graduate thesis (Osborne 2012), and more during a recent validation study (Dau 2016). Unfortunately, the CIE has yet to publish errata for CIE 171:2006, and there are currently no plans to do so. As a service to the lighting industry, then, the following is a complete list of known errors in CIE 171:2006. Hopefully, this information will ease the pain and suffering of anyone undertaking the work of validating a lighting design and analysis program against this document. The derivation of Table 19 is not explained in CIE 171, but it was presumably determined using form factor analysis. The following independent analysis indicates that the values presented in Table 19 are incorrect. As noted in Section 5.7.3, “To enable comparison between the simulation results and the analytical reference independently from the illuminance value over S2 or from its surface reflectance, the reference values are presented under the form of E / Ev· ρ (see Table 19). This is equal to the configuration factor between the measurement point and the unobstructed portion of S2. for measurement points E and F.
Table 19 of CIE 171:2006 is incorrect, likely because incorrect geometry was used for the calculations. The approach consists of analytically calculating the indirect illuminance of a closed sphere by an isotopic point light source and using this as the “approximate average indirect illuminance” of a square room. The test case geometry is a square room of dimensions 4 m x 4 m x 4 m (ST = 96 m2), with all surfaces being uniform diffusers and spectrally neutral. An isotropic point light source is positioned at the centre of the room with an output flux (f) of 10000 lm. The reflectance is the same for all interior surfaces and varies from 0% to 95%. This problem is compounded by the choice of surface discretization. A coarse mesh will tend to smooth the illuminance distribution, but it will also mask errors. 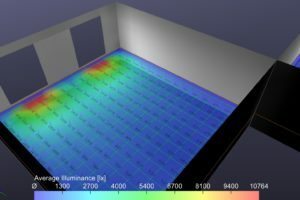 Without specifying a mesh resolution or how to average the results, it is difficult to compare the results from different lighting design programs that use the radiosity method. It is even more difficult to compare results from ray-tracing programs, as the results depend on the number of stochastically traced rays. Φ = direct luminous flux entering the sphere. The problem with this approach is that most lighting design programs do not separately report direct and indirect illuminance. It is therefore necessary to relate total illuminance to its indirect component for the special case of an integrating sphere. Table 1. Illuminance variation with reflectance. The test case analytical reference be amended to specify total illuminance rather than indirect illuminance. where q is the incidence angle. By setting q to zero, the calculated transmittance T is 0.878. CIE 171:2006 does not state the transmittance of 6mm clear glass. However, following Test Case 5.10, it should be assumed to be 0.878.
it assumes an external horizontal mask of uniform luminance Lob, which is derived in Section 5.13.1.1 from the external horizontal ground illuminance. It does not, however, consider the shadowing influence of the black room beneath it. It does not specify the mask surface reflectance rob. It requires the mask to have uniform luminance. However, the shadowing influence of the black room will result in a nonuniform luminance distribution. Given these flaws, Tables B.21, B.22, and B.23 should not be used. This test case should be restated such that the mask surface reflectance rob is zero, in which case the tables will have to be recalculated. It assumes an external vertical mask of uniform luminance Lob, which is derived in Section 5.14.1.1 from the external horizontal ground illuminance. It does not, however, consider the shadowing influence of the black room in front of it. Given these flaws, Tables B.24, B.25, and B.26 should not be used. Thanks to Dawn De Grazio (Lighting Analysts Inc.) and Wilson Dau (Dau Design and Consulting Inc.) for assistance in preparing this article. Carvalho, C. R. 2009. Avaliação do programa APOLUX segundo protocolos do relatório CIE 171:2006 referentes à illuminação natural. Dissertation, Federal University of Santa Catarina, Florianopolis (in Portuguese). Cunha, A. V. L. 2011. Avaliação do programa APOLUX segundo os protocolos de modelos de céu do relatório técnico CIE 171:2006. Dissertation, Federal University of Santa Catarina, Florianopolis (in Portuguese). Dau, W. 2007. Validation of AGi32 Against CIE 171:2006. Dau Design and Consulting Inc.
Dau, W. 2016. Personal communication. Dau Design and Consulting Inc.
Donn, M., D. Xu, D. Harrison, and F. Maamari. 2007. “Using Simulation Software Calibration Tests as a Consumer Guide – A Feasibility Study Using Lighting Simulation Software,” Proc. Building Simulation 2007, pp. 1999-2006. EDSL. 2015. Validation of TAS Daylight against CIE 171:2006. Environmental Design Solutions Limited. Geisler-Moroda, D., and A. Dur. 2008. “Validation of Radiance against CIE 171:2006 and Improved Adaptive Subdivision of Circular Light Sources,” Proc. Seventh International Radiance Workshop. Labayrade, R., and M. Fontoynont. 2009. “Use of CIE 171:2006 Test Cases to Assess the Scope of Lighting Simulation Programs,” CIE Light and Lighting. Labayrade, R., H. W. Jensen, and C. Jensen. 2009. “Validation of Velux Daylight Visualizer 2 against CIE 171:2006 Test Cases,” Proc. Building Simulation 2009, pp. 1506-1513. Labayrade, R., H. W. Jensen, and C. Jensen. 2010. “An Iterative Workflow to Assess the Physical Accuracy of Lighting Computer Programs,” Light and Engineering 18(2):66-70. Labayrade, R., and T. Sorèze. 2014. Assessment of SPEOS Against CIE 171:2006 Test Cases. Ecole Nationale des Travaux Publics de l’Etat (ENTPE). M. S. Langer. 1999. “When Shadows Become Interreflections,” International Journal of Computer Vision. 34 (2/3):193-204. Maamari, F., M. Fontoynont, and N. Adra. 2006. “Application of the CIE Test Cases to Assess the Accuracy of Lighting Computer Programs,” Energy and Building 38(7):869-877. Mangkuto, R. A. 2016. “Validation of DIALux 4.12 and DIALux evo 4.1 against the Analytical Test Cases of CIE 171:2006,” Leukos 12(3):139-150. Mitalas, G. P., and J. G. Arseneault. 1968. Division of Building Research Computer Program No. 28: Fortran IV Program to Calculate Absorption and Transmission of Thermal Radiation by Single and Double Glazed Windows. Ottawa, ON: National Research Council of Canada. Moraes, L. N., A. S. da Silva, and A. Claro. 2013. “Evaluation of the Software LightTool and APOLUX according to Protocols of Technical Report CIE 171:2006,” Proc. Building Simulation 2013, pp. 1079-1086. Osborne, J. 2012. Building a Comprehensive Dataset for the Validation of Daylight Simulation Software, using Complex “Real Architecture.” MSc. Thesis, Victoria University of Wellington. Paul, M. 2013. Personal communication. Pereira, R. C. 2008. Avaliaçã de ferramentas de simulação de illuminação natural por meio de mapeamento digital del luminânacias da abóboda celeste e entorno. Thesis, Federal University of Santa Catarina, Florianopolis (in Portuguese). In general, the luminance distribution of a non-convex object is determined not only by external illumination but also by interreflections between its surfaces. This issue has been extensively studied in the field of computer vision and image understanding. See, for example, Langer (1999).